Today I’m pleased to introduce Australian parent, writer and book reviewer, Aleesah Darlison, to The Book Chook. Aleesah is visiting as part of her blog tour for her series, Totally Twins. Yesterday, Aleesah was at More Than Words. The next stop on Aleesah’s blog tour is Book Blog, hosted by Dave Hibbins, where she’ll be stopping with Persephone, the main character in the Totally Twins series, for an interview. What’s The Go With Pokemon? When your seven-year-old comes to you and says, ‘Mum, I’d give my life for five minutes playing Pokemon,’ you know you’ve got a problem. I know he doesn’t really mean it. I know he doesn’t really understand what he’s saying. Still, it is rather frightening. And while his sentiments may be a little skewed on the dramatic side, his obsession with the game certainly isn’t. For him, the obsession is real and all-consuming. As a children’s author and book lover, I’ve tried to imbibe a love of books in my children from birth. In their short lives, I’ve read to all three of them for countless hours. We have hundreds of books throughout our house: in each child’s bedroom, in our lounge/library room, in my study. Books are scattered from one end of the house to the other. I love this. I believe in this obsession. I nurture it because I think books light the world, that books enlighten the world. Reading frees us, teaches us, inspires us, allows us to dream. But what can Pokemon, an electronic game teach us? The platform my son, Blake, plays Pokemon on is a DSi XL. Lots of kids have them. They’re the latest game craze going around. My husband and I held off for quite some time from buying Blake a DSi. However, after many months of pressure and pleading, we gave in and bought him one for his seventh birthday. When everyone else has one, how could it be wrong? Prior to taking possession of his DSi, Blake had been a bright, inquisitive boy who would spend hours upon hours building complex Lego creations and pouring over Lego catalogues. He would read and research all he could about dinosaurs, the universe, natural disasters, animals, bridges, rocks and minerals. He was, and still is, a gifted child. Reading came easy to him. He had a thirst for knowledge, a curiosity in the world around him that was awe-inspiring. The DSi and Pokemon abolished all that. He gave up all his other activities and wanted only to play Pokemon. All the time. Our well-rounded son with his amazing capacity for soaking up, retaining then regurgitating information was lost. All he could soak up, retain and regurgitate was the world of Pokemon. Interesting to his seven-year-old counterparts, perhaps, but how did it prepare him for adulthood and the outside world? Blake is not the only child to act like this. Our school is in the grip of Pokemon fever. Whenever I give my son and his friends a lift to some after-school activity, or he has friends over for a play date, the conversation is firmly focused on Pokemon. Who beat who in the latest battle. What ‘level’ they’re on. What Pokemon character has ‘evolved’. There’s a huge cast of Pokemon characters (493 in total) and the game possesses its own intricate, detailed jargon. Kids are fascinated and enthralled by it and I’m left to wonder what’s the go with Pokemon? What do kids find so irresistible about it? I know there are trading cards that kids collect and use to play in international tournaments. There are websites, games to download, chapters books, Pokemon Ultimate Handbooks (Blake has one and it is well-thumbed and dog-eared). And of course, there are the original Pokemon TV shows and movies. There is a vast world of Pokemon created in great detail that kids just adore. I can’t begin to understand this world. Only a die-hard fan would want to, so I will bow out now and show my age. Pokemon is for the young, it’s a huge wave of technology that is being surfed by our kids. But is it healthy? Is it a fad they will grow out of? Or are we dealing with something dangerous here? The grip Pokemon has on my son doesn’t seem to be letting up just yet so I guess only time will tell. Needless to say, we have now heavily restricted Blake’s use of his DSi and Pokemon. We have educated him on daily screen-time limits. I know other parents who have had to do the same thing with their children. Two hours on a Saturday is what we’ve shut Pokemon down to. It’s been extremely hard for Blake, being forced to give up something he loves so much. It’s been hard for us, too, to put up with the nagging and begging, to put up with the desperate pleas to play Pokemon. And the dramatic declarations of ‘my life for Pokemon’. Still, I know we’re doing the right thing by weaning him off the mind-zapping, electronic game side of his addiction. Despite his misery and grief for the loss of the game, his interest in the world around him has rekindled. Pokemon is there at the back of his mind for most of the day, but if he’s kept busy he manages okay. And I’m hoping it will get better. As well, I’ve tried to salvage something out of this obsession. I try to encourage Blake to play trading card games with his friends and read his Pokemon books to enjoy the Pokemon world that way. Reading about Pokemon isn’t so bad. There is literary merit - and literacy merit - in every book. It’s just the hours and hours on end of staring at a screen and the fear that my son’s brain is turning to mush that I can’t abide. Aleesah Darlison writes picture books and novels for children. She also reviews books for The Sun Herald. 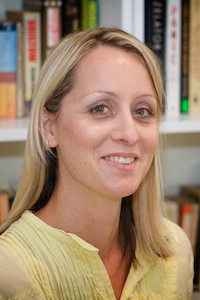 Aleesah has won many awards for her writing including an ASA mentorship with Kate Forsyth in 2009. Her stories have appeared in the black dog books Short and Scary Anthology, The School Magazine and Little Ears. Her first picture book, Puggle’s Problem, was released in July. 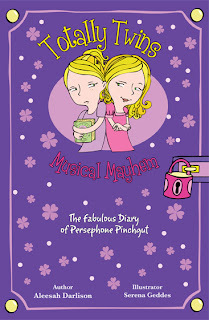 Her junior series for girls aged 9 plus, Totally Twins: Musical Mayhem, was released this month. The series follows the adventures of identical twins, Persephone (she’s the sensible one) and Portia (she’s the messy one) Pinchgut and is written in diary format by Persephone. To find out more about Aleesah, visit her website.Or check out her tour schedule and follow her on the tour! Thanks so much for sharing your dilemma and solution with us, Aleesah. There was an interesting article in the Wall Street Journal recently which drew the same conclusions. Parenting is such a balancing act, isn't it? Thanks for your honesty here Aleesah. It's a tough balance isn't it? We recently purchased a DS for our nine-year-old daughter. It hasn't been a problem as such but, like you, I am ready to pull the plug if it starts to take over our life. I have noticed, however, that she will say "I just have to finish this level" or "I just NEED to get this one more thing". We've talked about this and are still working on it. I'm sure the programers design this sort of addiction into the games. We don't have the game pokermon. I don't know why but for some reason I didn't like the look of it??? lol. Hmm, maybe there's a lesson in that: we can trust our instincts as parents. Thank you Aleesha for a brutally honest and real view of the world of our children!! Fabulous post! Boundaries are so important, after all, we couldn't spend hours on Facebook etc while at work without some sort of consequence. We are assisting our children now to learn the necessary skills for adulthood. We didn't have video games as kids, but I know my brother and I would say "I just need to finish this chapter" or secretly read under the bedcovers by torchlight. Were we addicted to books? Probably. We watched and loved TV too, but didn't seem so consumed by it. We played outdoors too, mostly imaginative games based on our books and TV shows. And yet, I don't look on that addiction as a bad thing. I think Aleesah's point about an obsession totally blocking out all other forms of activity is huge here. If my reading had done that, maybe it would have been "a bad thing"? Good point, T(w)een Factor blogger. We sure don't do our kids any favours by not having consequences for their actions! Yes, it does seem hard to limit kids' time on all the gadgets they have. Even TV can be a problem and with all the Foxtel channels there is so much for them to watch. Sometimes, I think it is that visual stimulis that their brains need and crave. But what of their physical needs? TV and video games seem to substitute for babysitters these days and when parents are so busy with other things, it's an easy option. One of the worst things I've seen has been when families are out to dinner and the kids (sometimes tiny toddlers) are given portable DVD players to watch at the table or they're glued to a game. Whatever happend to enoying the experience of being out together? It's true, books can be addictive! I guess that was my problem when I was a kid. I don't know how many times I was told to 'get my head out of a book' - you remember the old term, 'bookworm'. Has that been lost? Are kids now all 'videoworms'? There is some good news for Blake: I bought him the first book in 'The Diary of a Wimpy Kid' series. He read it in one day, so I bought him the second book and he's already 3/4s through. He's doing drawings of the characters and quoting scenes out of the book and the movie... Whenever he finishes one book he will get the next. At last, a positive obsession (as I see it anyway). Please, Jeff Kinney, write some more diaries!! I'm sure he would like comics and manga - next stop, the library! Very interesting question. I think anything that becomes an obsession is probably not a good thing. I think there is a difference between addiction (or obsesssion) and passion. What you describe to me is a passion and, of course, will take up a lot of your time. Passions can become addictions too. lol. On books though, there is just something very edifying about reading... it has so many benefits, not just the entertainment value. So that's a huge redeeming factor in my eye. Agreed, Kelly. I guess that for me, reading and writing are so important for education, that I think they "should" be priorities in all our lives. Well, I banned scribbling with green texta on cedar furniture in our house! But yes, I take your point, if we can find balance, and help our kids find balance, that seems to me the most realistic and yet respectful way to go. LOL@Kelly - hmm, The Book Chook is already an outpost for the Mem Fox Fan Club, maybe we could make it the RAA headquarters too? (Reading Addicts Anonymous) Anyone else want to admit to their problem? I'll start! My name's Susan and I am a Reading Addict. I cannot leave the house without a book. Where other women pack makeup or Kleenex, I automatically reach for my reading glasses and a book. I watched a documentary here in the states about video game addictions. After watching the video it seems to me that the reason that the video games are so addicting is because they let people think and try and question but there is huge reward for success...moving to the next level. People begin to feel like demi Gods and are constantly working to beat the game. All of the characteristics that you listed about your son are probably being played out differently when he plays the video game. He feels recognized and rewarded for his critical thinking. I think it is good of you to limit the screen time. I also think that he will outgrow this phase and find a new activity to devote himself so wholly to. My brother grew up in the era of Pokemon cards...no video games. They took over the house for a while and were all he talked about. But soon they were out of fashion and he was on to Pogs. That's an interesting take on the video game phenomenon, Kelly. I must not have a yen to be a demi god, maybe because I tend to play word games, which are not structured as much with levels. But I have certainly seen the attraction in others. Hi Aleesah, Great post and I think you are absolutely right to limit your sons time spent on the game. I do think there is an addictive aspect to computer games - apparently they overstimulate the brain's pleasure centre and make it hard to enjoy other pleasures. That said, I remember being addicted to the card game 'Racing Demons' for a while as a kid, so maybe it's just the competitive aspect. Also, kids do get rather obsessed with the latest fads. I guess the big difference is that computer games, (and all screen based enterainment) leads us to block out the needs and thoughts of both ourselves and others. That's probably why they need to be treated more cautiously than other obsessive fads, like yo-yos or playing elastics! Good points, Katrina. I think its that obsessive tendency that worries parents most. I used to try to work out fads and how they became that way. Suddenly yo-yos would spring up and proliferate overnight, and just as suddenly go again. Same with playground chants and rhymes, string games etc. And it always fascinates me that we can find similar games and fads on different continents.